[ FREE PUZZLE GAME! ] No in-game purchases or upgrades--this game is entirely free from beginning to end! Solve picture puzzles as if you were filling out a coloring book! Complete puzzles to uncover full-color characters from iconic nostalgia games! 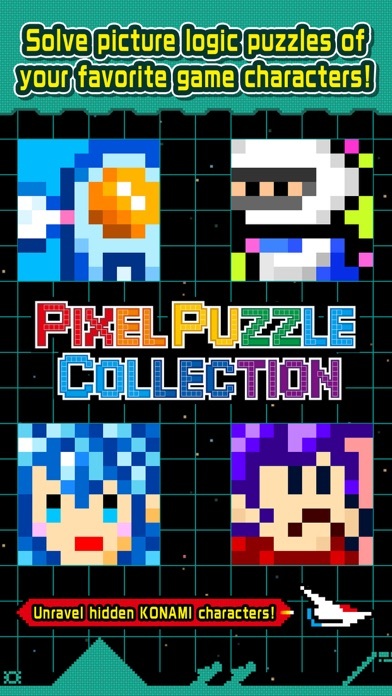 Loads of puzzles to play, and tons of collectable pixel art on the go! 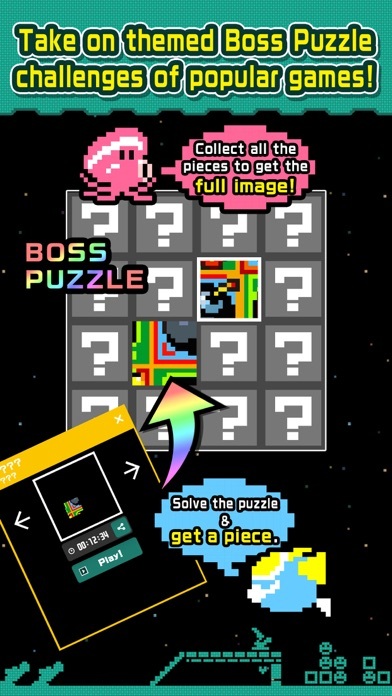 Take on Boss Puzzle challenges and collect small puzzle pieces to complete one jumbo pixel art piece! [ FEATURED TITLES ] Frogger, Contra, Bomberman, Mystical Ninja, Castlevania, Parodius, Life Force, Gradius, Block Hole, Sunset Riders, Nemesis, Track & Field, Star Soldier, TwinBee, Milon's Secret Castle, Yie Ar Kung-Fu, Crazy Cross...and more! [ About pixel logic puzzles ] Also known as nonograms, pixel logic puzzles are absorbing and addictive puzzles that use number clues and easy-to-follow logic to reveal awesome color pictures! If you love old-school games and enjoy puzzles games such as number place, crosswords, jigsaw and other brain teasers--this is the game for you! 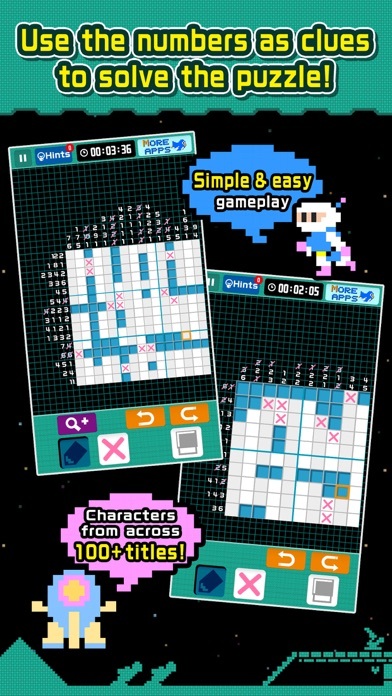 This is exactly the way a mobile picross should be!!!! You hear a lot of negative talk about Konami, not undeserved, but with this game they’ve written a beautiful love letter to classic games. This one will hit you right in the feels. In general, the game is so fun. Of course, completely free, even without any ads. The only question is why make us wait for 3hrs to play one boss level? 2 things bother me. 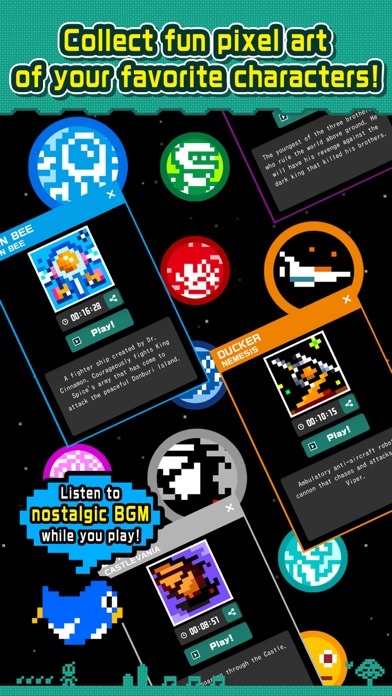 First is the fact that the puzzles are selected by the game and not the player. Second and more importantly is the fact that you have to wait if you get stuck. You don’t even have the option of watching ads or just turning the game off. You should have the timer move even when the player isn’t playing the game. Have been playing this since release. I went through the puzzles in the 5x5 and 10x10 sets fairly easily. When going into the 15x15 this is where I have usually stopped with other games. Not with this. There are so many puzzles to do it makes no sense. Almost like they don’t make games anymore and don’t care (Sigh). I’ve forced myself to learn how to solve these harder puzzles. For a while I thought some boards were impossible without the use of hints but after staring and making my placements with more cross checking I’ve become a better picross player. This is the game I have on phone and tablet and love playing through them again and again. Also. I feel I have played this a lot (since release) and have only made it 49.6%. There are a lot of puzzles. Love the game and the puzzles but lately as soon as it enters into the main puzzles, it freezes and I have to clear my app and wait AN HOUR to open it back for it to work properly again.